Analysis: Miller twice dislocated his left shoulder last season and ultimately underwent corrective surgery in January. It's not ideal that he may be limited in OTAs this spring, but Miller's health won't be a huge concern for his fantasy outlook for 2019 unless his recovery extends into training camp. Analysis: Miller will have the left shoulder that endured multiple dislocations throughout his rookie season addressed by the procedure. Given the timing, he should be ready to go in advance of training camp this summer. The 2018 second-rounder finished up his first pro campaign with 33 catches (on 54 targets) for 423 yards and seven TDs in 15 games. He's likely to see his role in the Chicago offense expand in 2019, a context that makes the 5-foot-11, 190-pound slot man a fantasy breakout candidate. 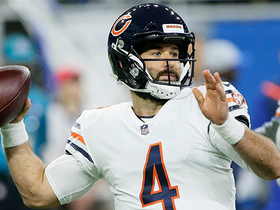 Analysis: During the first half, the Bears frequently worked the middle of the field, which allowed Miller to be productive, but after the intermission, Mitchell Trubisky focused more on a downfield attack, which kept the rookie from having a better performance. As a rookie, he caught 54 passes for 423 yards with seven touchdowns, and he'll likely see an expanded role next year, making him a player who could quickly become a consistent fantasy factor. Analysis: Miller, Allen Robinson (ribs) and Taylor Gabriel (ribs) all started the week as full participants ahead of Sunday's playoff game against the Eagles. Mitchell Trubisky should have all his weapons available, and the weather forecast is surprisingly tame for January in Chicago. Analysis: Miller appeared to dislocate his left shoulder early on during Sunday's victory over Minnesota, and the receiver never returned to the field. With only a week's worth of time to heal up before Sunday's playoff opener against the Eagles, Miller likely will need a quick recovery in order to avoid missing any games. Nagy's comments provide optimism that the rookie may not have to. Coach Matt Nagy said Miller injured his left shoulder during Sunday's 24-10 victory at Minnesota. 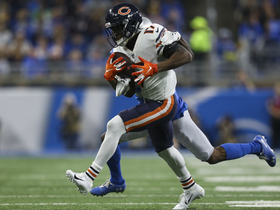 Analysis: Both Miller and Taylor Gabriel (ribs) left the contest in the second half, which leaves the Bears even more banged-up in the receiving corps than when it started. Allen Robinson (ribs) was inactive in the regular-season finale, so Bears practice reports will be of interest as they prepare for a wild-card game against the Eagles. Miller was forced out of Sunday's game against the Vikings with a shoulder injury. Analysis: Prior to his first-quarter exit from the contest, Miller was not targeted. Next up for the team's targets with Allen Robinson (ribs) out are the likes of Taylor Gabriel, Josh Bellamy, Kevin White and Javon Wims. 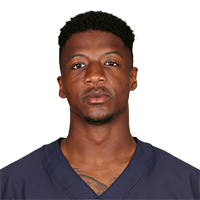 Miller is expected to handle more snaps than usual with Allen Robinson (ribs) inactive for Sunday's game against the Vikings, James Neveau of NBC 5 Chicago reports. Miller caught three passes for 24 yards and a touchdown while rushing once for an additional four yards in Chicago's Week 16 win over the 49ers. Analysis: Miller caught a short touchdown while catching each of his three targets in a game the Bears threw the ball fewer than 30 times. He's only exceeded 25 yards once over his last six games, and his fantasy value has mostly come by him finding the end zone in seven games. With just six catches for 25 yards this month, he won't be a recommended fantasy option against a tough Minnesota defense in Week 17. Miller wasn't targeted in the Bears' Week 15 win over the Packers. Analysis: Miller hasn't been targeted in two weeks, and after being a solid performer in the middle part of the season, his recent floor makes him a massive lineup risk as the season winds down. Miller wasn't targeted in Chicago's 16-6 win over the Rams. Analysis: This was the first time all season that Miller failed to catch a pass, but he's averaging fewer than three targets over his last four games. 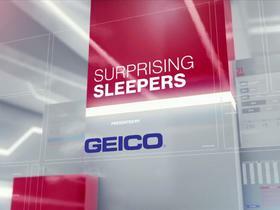 Based on his lack of volume, he's become a touchdown-dependent fantasy option. 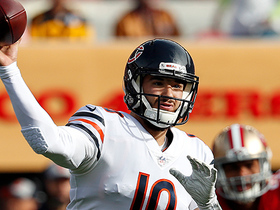 Miller caught a one-yard touchdown pass in the Bears' 30-27 overtime loss to the Giants. Analysis: Despite Chase Daniel throwing 39 passes, Miller's two targets were the fewest he's seen all season. Fortunately, when Tarik Cohen threw a pass on a trick play, Miller was on the receiving end of the one-yard score to salvage his fantasy day. He's only surpassed 50 yards once this season, but he's scored a touchdown in five of his last eight games. His llack of yardage upside makes him a bit touchdown-dependent as a fantasy option. Miller caught three passes for 41 yards while adding an eight-yard pass completion in Chicago's 23-16 victory over the Lions. Analysis: Miller wasn't a big part of the Bears' game plan with Chase Daniel starting at quarterback, as he was targeted just four times, but he did complete a pass to his quarterback on a trick play to move the chains. With at least 35 yards in five of his last six games along with four touchdowns since Chicago's Week bye, he's emerged as a solid fantasy performer in his rookie season. Miller caught two passes for 25 yards and a touchdown in the Bears' 25-20 victory over the Vikings. Analysis: With Chicago leading for most of the contest, Miller saw just three targets while serving as Mitch Trubisky's third option among the Chicago receivers. However, he cashed in by finding the end zone for the fourth time over the last six games, giving him five scores on the season. With just a single game over 50 yards on the season, he's settled in as a mostly touchdown-dependent fantasy option. 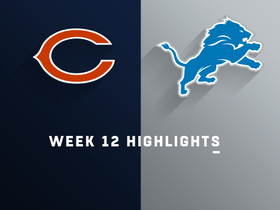 Miller hauled in five of six targets for 122 yards and a touchdown in the Bears' 34-22 win over the Lions on Sunday. Miller caught five of six targets for 49 yards and added a 9-yard run during Sunday's 41-9 win over Buffalo. Analysis: The catches and yardage were career highs for the 2018 second-round pick, likely the product of an inactive Allen Robinson (groin) and dinged-up Taylor Gabriel. Miller is dangerous in space but has yet to have a breakout performance warranting too much confidence in him. Next Sunday might force fantasy owners' hands as Chicago takes on a Detroit pass defense ranked toward the bottom of the league in opponent passer rating. Miller turned seven targets into three catches for 37 yards and a touchdown while rushing once for seven yards in Sunday's 24-10 win over the Jets. Analysis: Miller did well to get both feet down in the back of the end zone on his four-yard touchdown in the third quarter. The rookie has shown a nose for the end zone with three receiving scores in his first six NFL games. He saw a slight bump in role with Allen Robinson (groin) inactive, and that could be the case again in Week 9 against Buffalo. 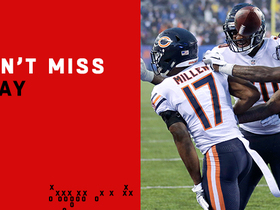 Miller caught two passes for 35 yards in Chicago's Week 7 loss to the Patriots. Analysis: It was encouraging that Miller saw a season-high seven targets, but his 35 yards tied his season high that he previously matched in Week 3. Despite his low yardage totals this season, he's already found the end zone twice, making him a touchdown-dependent flex option for fantasy managers. Miller caught one pass for a 29-yard touchdown in Chicago's Week 6 loss to the Dolphins. Analysis: Miller caught his second touchdown over the last three games he's played. However, with just nine catches and four games played, he'll be a touchdown-dependent fantasy option unless his role in the offense increases. Miller (shoulder) practiced fully Wednesday. Analysis: Miller suffered a dislocated left shoulder Week 3 and missed the Bears' Week 4 beatdown of the Buccaneers. However, the team's bye week has been a boon to Miller's health. It's unclear if he'll wear some sort of harness to avoid an aggravation of the shoulder injury, but he can now prepare in earnest for Sunday's showdown with Miami, whose defense has conceded 8.8 yards per target and three touchdowns to wide receivers this season. Coach Matt Nagy said that he was hopeful Miller (shoulder) would practice Wednesday. Miller (shoulder) has been ruled out for Sunday's game against Tampa Bay, Rich Campbell of the Chicago Tribune reports. Analysis: Miller tried to play through the pain after separating his shoulder in last week's win over Arizona, but he didn't have much luck and hasn't been able to practice since. The Bears likely will turn to some combination of Josh Bellamy and Kevin White to handle the No. 3 wide receiver job in a favorable matchup with the Buccaneers' leaky secondary. Miller has accounted for just 11 of the Bears' 104 targets, well behind Allen Robinson (28), Taylor Gabriel (22) and Trey Burton (15). Miller (shoulder) didn't take part in Thursday's practice, Dan Wiederer of the Chicago Tribune reports. Analysis: Miller was visibly shaken up multiple times Week 3 at Arizona with what was later termed a dislocated left shoulder. On Thursday, coach Matt Nagy told Brad Biggs of the Chicago Tribune that he doesn't believe Miller will need surgery on the region. While Miller hasn't been ruled out for Sunday's game against the Buccaneers, there's a sense that a multi-game absence is in store for the rookie wide receiver, Ian Rapoport of NFL Network reports. Miller (shoulder) didn't practice Wednesday. Analysis: Miller played through a dislocated shoulder for part of Sunday's 16-14 win over the Cardinals, finishing with four catches for 35 yards on five targets. The Bears will need Josh Bellamy and/or Kevin White to handle the No. 3 receiver role if Miller isn't fit to play Week 4 against Tampa Bay. Miller's potential absence wouldn't be an overly significant one for Chicago, given that the rookie has drawn just 11 targets through three games. Coach Matt Nagy said Miller (shoulder) is day-to-day. Analysis: Miller dislocated his left shoulder during Sunday's win over the Cardinals and initially tried to play through the injury. He did catch four of five targets for 35 yards, but he was only on the field for 49 percent of Chicago's offensive snaps. Josh Bellamy and/or Kevin White will fill in as the No. 3 wide receiver if Miller isn't ready for Sunday's game against Tampa Bay. Miller dislocated his left shoulder Sunday, the Chicago Sun-Times reports. He returned to the game and tried to play with it, but was in obvious discomfort. Analysis: We'll have to wait for the prognosis over the next couple days, but the injury is potentially serious. Taylor Gabriel, Allen Robinson, Tarik Cohen and Trey Burton figure to see more targets should Miller miss time. Miller caught two passes for 11 yards and a touchdown in Monday's victory over the Seahawks. Analysis: For the second game in a row, he's received just three targets, making him a clear fifth option in the passing attack behind Allen Robinson, Taylor Gabriel, Trey Burton and Jordan Howard. Aside from the touchdown, he's yet to reach 15 yards in either game, and unless he gets increased target volume, he'll be a shaky fantasy option. Miller caught two passes for 14 yards in Sunday's loss to the Packers. Analysis: Aside from Miller showing great hands on a 14-yard reception in tight traffic, he wasn't a featured part of the offense in the season opener. With a number of versatile receiving threats on the roster, it's unlikely that Miller will command a large target share on a regular basis, though he'll certainly have his share of productive games with his ability to be a reliable weapon in the middle of the field for Mitchell Trubisky. Miller will not play in Saturday's preseason game against the Chiefs, Kevin Fishbain of The Athletic Chicago reports. Analysis: Miller has impressed enough this preseason to warrant sitting out the third game with most of the starters, while Kevin White and Taylor Gabriel (foot) were not listed among the inactives. The rookie wideout could return to the gridiron for the preseason finale Thursday against the Bills. Miller caught three passes for 33 yards in Saturday's preseason victory over the Broncos. Analysis: Miller's had an impressive camp and he followed that up with a solid performance against Denver's first-string defense. Although the rookie is expected to start his NFL career primarily in the slot, he certainly could earn some work on the outside, especially as Taylor Gabriel (foot) continues to miss valuable practice time. As a player who often can be drafted in the double-digit rounds, he easily could reward fantasy owners with production well beyond his draft-day cost. Miller caught one of two targets, losing a yard on the play, during Thursday's 30-27 loss to Cincinnati. Analysis: Miller's lone reception came on a short pass from Mitchell Trubisky on third and long. 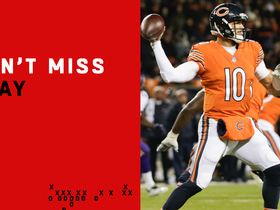 He stayed in the game after Trubisky departed, but was missed deep by Chase Daniel. Miller offers some appeal in what should be an innovative Matt Nagy scheme, but fans will have to wait at least another week to get a better sense of what the rookie can be. 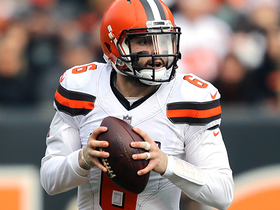 Miller is expected to primarily work from the slot, ESPN.com's Jeff Dickerson reports. Chicago Bears quarterback Chase Daniel tosses the ball to wide receiver Anthony Miller and goes out to catch a pass from Miller for eight yards. 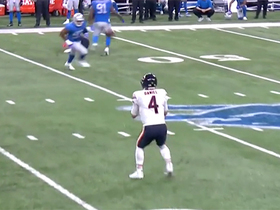 Chicago Bears quarterback Chase Daniel hits wide receiver Anthony Miller across the middle for a 26-yard gain. Chicago Bears quarterback Chase Daniel completes a 6-yard pass to wide receiver Anthony Miller, for his first completion in a Bears uniform. 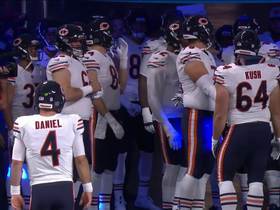 Chicago Bears quarterback Chase Daniel is a little anxious for his debut as he runs onto the field before his team in the Week 12 matchup with the Detroit Lions.